The means used to study their impact on human health are generally the same as those described earlier for mineral impurities (see mineral impurities). Organic "artificial" micropollutants created by Man’s activities (e.g. pesticides, hydrocarbons, etc.) which, although present at levels of a few µg· L–1 (whence their name), can present a danger to public health and these micropollutants will be described further on, highlighting the most dangerous. Natural organic matter ( OM or NOM ) that accounts for the majority of the organic matter found in water. From a practical viewpoint, within the context of routine analyses, organic substances are identified analytically either by measuring global indices or by measuring reactional groups or yet again by measuring target substances (micropollutants, prioritising those whose presence is foreseeable in view of local conditions) using chromatographic techniques (see measuring global parameters). These are measurements that provide results that do not express a concentration of a clearly defined organic chemical substance but that concern a property that is shared by a great number of substances. Even when it is impossible to link a global parameter to a toxicity and/or cytotoxicity measurement or to a measurement of a carcinogenic and/or mutagenic effect and, consequently to establish limit concentration levels, if these parameters are monitored throughout a treatment system, they can be used to optimise a plant's operation and to compare several systems with each other. For instance, in the USA, they recommend strengthening clarification treatment when dissolved organic carbon levels exceed 4 mg·L–1. TOCl (or TOX ) provides an indication of chlorinated (or halogenic) organic matter concentration levels. These levels rise after water has been chlorinated and must be as low as possible in the water delivered at the consumer’s tap. This natural OM is harmless to human health but does have the drawback of affecting all drinking water treatment processes; in particular, this OM constitutes a reservoir of precursers of unwanted oxidation by-products (see pollution generated by water treatment) such as trihalomethanes ( THM ), haloacetic acids ( HAA ) or haloacetonitriles ( HAN ) that are created during chlorination, or aldehydes, with their fruity orange odour, that are created during ozonation. Additionally, OM are responsible for fouling membranes and for competition phenomena that occur when "artificial" micropollutants are adsorbed over granular activated carbon. 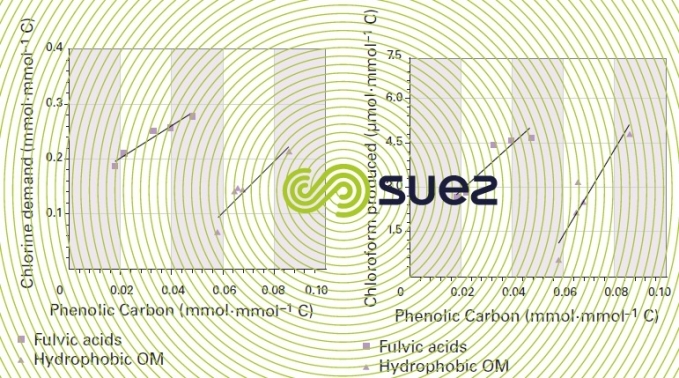 The following illustrations (figures 7 and 8) show the direct impact made by the phenolic carbon proportion of fulvic acids and by the hydrophobic NOM (measured using the carbon 13 NMR ) on chlorine demand and on the quantity of chlorine generated during chlorination (water from five different sources). Albeit difficult, characterising natural OM is extremely important in providing a better long-term understanding of the phenomena involved in treatment processes. This natural organic matter has a variable and complexe structure and is mainly studied using spectroscopic techniques (such as infrared or ultraviolet absorption, carbon 13 NMR). Thus, by using the GC-MS pyrolysis technique, we can state that the thermal decomposition fragments of OM extracted from water of various origins invariably come from the following biopolymers that make up the greater part of the animal and plant biomass. Polysaccharides (cellulose, starch), aminosaccharides (present in bacteria and fungii walls), proteins, polyphenolic substances (created by the decomposition of tannins and lignins) (figure 9). The term « micropollutants » regroups generally very low concentrations of small, synthetic organic molecules. In general, the most toxic molecules, particularly in the long-term (cancerous growths) include two aromatic rings or nitrogen atom rings. At this moment in time, it is namely pesticides which have been integrated into standards. These products are mainly used in agriculture to combat plant enemies (herbicides, insectides, fungicides, algicides). Some of these products will hydrolyse quite rapidly but others are particularly resistant and will accumulate in the food chain. The most prevalent pesticides in agricultural countries belong to the family of triazines (atrazine, simazine, terbutylazine…) and to the phenyl ureas (isoproturon, diuron…). Some of these products are toxic and others are mutagenic or carcinogenic. In its 1994 publication, the WHO issued recommendations on approximately forty pesticides. We have shown the most significant of these below in table 11. For a better level of protection, European and French regulations (see quality standard) have set more stringent limit concentration levels (parametric values): 0.1 µg·L–1 per individual substance (excluding: 0.03 µg·L–1 for aldrin, dieldrin, heptachlorine and epoxy heptachlorine) and 0.5 µg·L–1 for the sum of substances sought. The most significant new feature of recent legislation concerns the inclusion of pesticide metabolites (products of chemical or biochemical degradation produced by the original molecules): the parametric value of these products will be the same as for the original pesticide. These substances are posing a new problem to water specialists in so far as pesticide metabolites tend to be more polar than their parent pesticides and, therefore, more difficult to eliminate. Thus, desethylatrazine, the majority breakdown by-product of atrazine, is more difficult to adsorb using activated carbon. As a reminder, please refer to pollution generated by water treatment. Many deep waters have been contaminated by these substances: industrial discharges, substances injected into drainage wells, discharge lixiviates. These substances are more or less carcinogenic or mutagenic and must be eliminated. 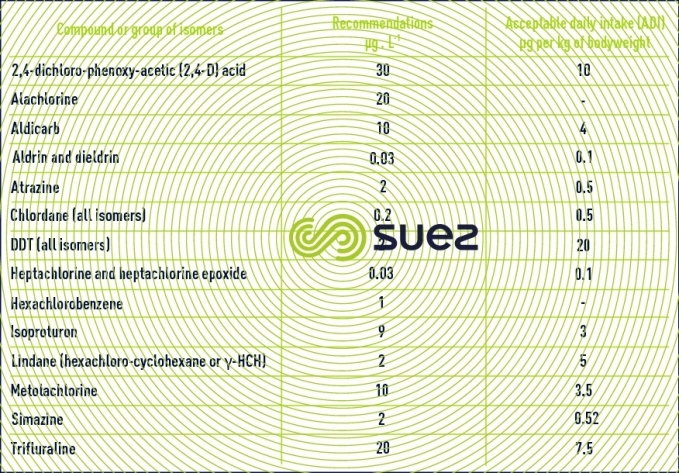 These solvents have been targeted by WHO recommendations as shown in table 12. For some, European limits are even lower. Phenols and their derivatives constitute an industrial pollution index. The most noticeable nuisance they create is the chlorophenol taste that occurs in water in the presence of chlorine and the fact that this happens for very low content levels. If, as a rule, we only have to reduce the pure phenol content to 1 µg·L–1 in order to avoid the issue of taste, in some cases, there will still be traces of a chlorophenol taste at content levels of 0.1 to 0.01 µg·L–1, or even 0.0005 µg·L–1in the case of 2.6-dibromophenol. These levels are very difficult to determine, even when using the most sophisticated chromatographic analysis techniques. The chlorophenol organoleptic detection threshold is significantly below the levels that would consitute a health hazard for consumers: therefore, these substances will be eliminated down to the point where they are imperceptible to taste. Hydrocarbons that are likely to pollute surface water or groundwater are mainly produced by oil product, sump oil and various industrial effluent discharges. Aromatic hydrocarbons are particularly soluble. They biodegrade slowly. When accidental pollution occurs, aromatic hydrocarbons remain present for a limited period of time at a river plant’s water intake whereas they may persist for a very long time in groundwater (sometimes several years due to the soil’s retention capabilities). That is why groundwater resources must be strictly safeguarded against hydrocarbon contamination. toxicity : this feature could be expected in drinking water where this additive is present in amounts in excess of the odour and taste appearance threshold. Skin conditions due to fuel oil additive products have been reported. Additionally, fuel and exhaust gases constitute the main source of benzene in the environment. This compound is carcinogenic to Man and is the object of WHO recommended levels equal to 10 µg·L–1. European legislation on drinking water is far more stringent, with a parametric value of 1 µg·L–1. Toluene and xylenes are also present in petrol. These compounds are less toxic than benzene. Some substances are highly carcinogenic and must be totally eliminated. The WHO recommendation for benzo(a)pyrene is of 0.7 µg·L–1whereas European legislation for this compound is extremely stringent: the maximum permissible concentration is equal to 0.01 µg·L–1. Of the other PAH, we should mention benzo(b)fluoranthene, benzo(k)fluoranthene, benzo(g,h,i)perylene and indeno(1,2,3-Cd) pyrene, where total levels must remain below 0. µg·L–1 in Europe. Furthermore, we need to remain vigilant in respect of a possible PAH diffusion into mains water through pipelines or old reservoirs lined with coal tar. These products were being developed until the mid 1970’s for use in different applications: plastifiers, solvents, lubricants, heat exchanger hydraulic fluids. In particular, they were used in the construction of transformers and capacitors. These products are known in France under the trade name of Pyralene. They are usually found in low concentration but can occasionally be detected further to accidents or when old transformers are being handled. When subjected to combustion or pyrolysis, they can emit products suspected of being highly toxic: polychloro-dibenzofurannes ("furans") and polychloro-dibenzodioxines ("dioxins"). These are particularly stable products and, therefore, widespread in the environment. They can be assimilated by living beings and can be transmitted through the food chain. In natural water, they are especially present in the particulate phase and, therefore, will mostly be eliminated through clarification. Detergents are synthetic surfactants or surface agents. Their presence in water is caused by urban and industrial effluent discharges. cationic surfactants, consisting of quatenary ammonium salts, are rarely used and reserved to the special applications associated with their biostatic properties. enzymes that contribute to the hydrolysis of certain types of soiling. 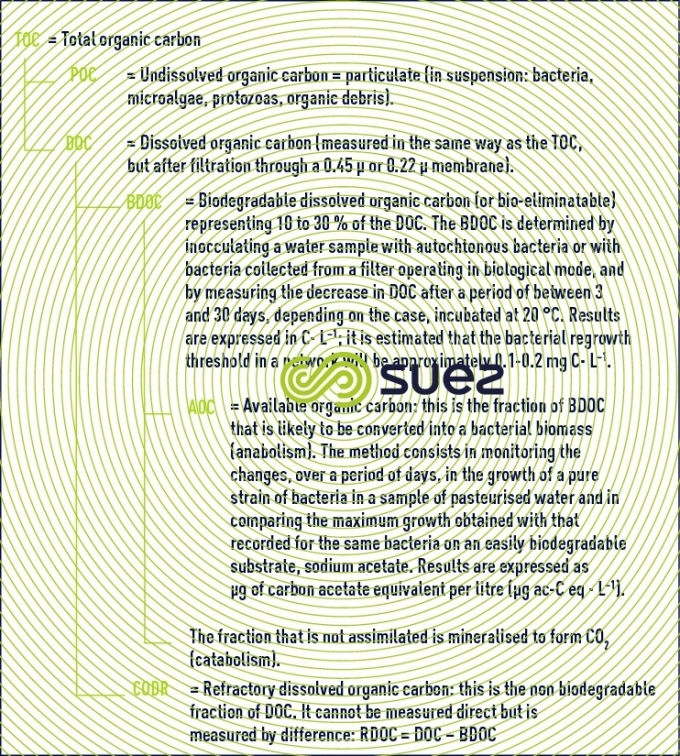 Before biodegradable products were used, the levels of anion detergents varied by 0.05 to 6 mg·L–1 in river water. These levels have significatly decreased since. Non-ionic detergent concentrations are difficult to express because of the many dispensing systems used, their accuracy and of non-ionic detergent detection limits. Due to the toxicity of these products, research is currently focusing on concentrations of the shortest nonylphenols (NP, NP1, NP2, NP3) in different sectors of the environment, including water resources. the gradually increasing boron levels in surface and deep water as the result of significant amounts of sodium perborate used in detergents. With the exception of nonylphenols, detergents do not present any toxicity hasard for bacteria, algae, fish or other river organisms, at least providing that their concentration remains below 3 mg·L–1. With nonylphenols, lethal concentrations for aquatic organisms (CL50) vary from 0.1 to 0.3 mg·L–1. Finally, enzymes added to detergents do not represent any nuisance factors for receiving mediums or treatment plants. In addition to the conventional pollutants quoted above, thousands of unwanted substances are likely to contaminate aquatic mediums. Although regulations only apply to a limited number of substances, in the past, complete catchment basins have been taken out of action after the discovery of substances that are not covered by any regulations. Thus, a catchment basin in Eastern France, supplying water to 30 000 consumers, was taken out of action when it was found to contain traces of dinitrotoluene. Of the most unwanted substances, due to their carcinogenic potential, we have the amine (ani­lines), fluorinated or nitrated aromatic compounds and also nitrosamines. During the mid 90’s, several new problems emerged with regard to the quality of aquatic environments; in particular, there was the case where traces of certain families of "drugs" were found and especially substances causing endocrine-related disorders. In fact, the issue involved not only of drug residues but also the synthetic hormones found in the contraceptive pill or their degradation products. In effect, numerous natural (natural hormones secreted by Man, plant hormones) or synthetic (some organochlorine pesticides, PCB, phtalates, bisphenol A, nonylphenols, tributyltin) substances were found to be capable of interfering with the endocrine system (responsible for regulating the reproduction function) in aquatic organisms or in mammals. The decline of certain animal populations (Florida alligators, grey seals in the Baltic Sea) has been attributed to such substances. In Man, the possible link between these substances and decreasing male fertility is now being queried. The increase in the number of testicular, prostate and breast cancers and even other genital abnormalities might also be ascribed to these substances. Many national or international ( OECD, USEPA, EEC ) organisations have launched research programmes designed to individually test thousands of substances and to put in place chemical and biological tests capable of measuring these types of substances or their effects. It is therefore quite likely that legislation will change and, in any case, our treatment plants will have to be capable of guaranteeing that the emerging pollutants are eliminated.